Algebraic notation (or AN) is a method for recording and describing the moves in a game of chess. It is now standard among all chess organizations and most books, magazines, and newspapers. In English-speaking countries, algebraic notation replaced the parallel method of descriptive notation, which became common in the 19th century and continued with sporadic use as recently as the 1980s or 1990s. European countries, except England, used algebraic notation before the period when descriptive notation was common. Algebraic notation exists in various forms and languages, and is based on a system developed by Philipp Stamma. Stamma used the modern names of the squares, but he used p for pawn moves, and the original file of a piece (a through h) instead of the initial letter of the piece name. This article describes standard algebraic notation (SAN) required by FIDE. Each piece type (other than pawns) is identified by an uppercase letter, usually the first letter in the name of the piece in whatever language is spoken by the player recording. English-speaking players use the letter K for king, Q for queen, R for rook, B for bishop, and N for knight (since K is already used). S (from the German Springer) was also used for the knight in the early days of algebraic notation, and is still used in chess problems (where N stands for the nightrider, a popular fairy chess piece). Other languages may employ different letters, for example, French players use F for bishop (from fou). In chess literature written for an international audience, the language-specific letters are replaced by universal icons for the pieces, resulting in figurine notation. Each move of a piece is indicated by the piece's uppercase letter, plus the coordinate of the destination square. For example, Be5 (move a bishop to e5), Nf3 (move a knight to f3), c5 (move a pawn to c5 - no piece letter in the case of pawn moves). In some publications, the pieces are indicated by icons rather than by letters, for example: ♞c6. This is called figurine algebraic notation (FAN) and has the advantage of being language-independent. Some texts, such as the Encyclopaedia of Chess Openings, omit indication that any capture has been made. (For example, Be5 instead of Bxe5; ed6 instead of exd6 or exd6e.p.) When it is unambiguous to do so, a pawn capture is sometimes described by specifying only the files involved (exd or ed). These shortened forms are sometimes called minimal or abbreviated algebraic notation. 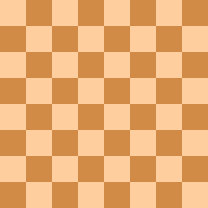 both the file and rank (if neither alone is sufficient to identify the piece - which occurs only in rare cases where one or more pawns have promoted, resulting in a player having three or more identical pieces able to reach the same square). In FIDE Laws of Chess, an equals sign with parentheses, "(=)", is used to write the offer of a draw on the scoresheet next to a move, but this is not part of algebraic notation. A move that places the opponent's king in check usually has the symbol "+" appended. Or sometimes a dagger (†) is used, or the abbreviation "ch". Double check is commonly indicated the same as check, but is sometimes represented specially as "dbl ch", or in older books as "++". The Encyclopedia of Chess Openings omits any indication of check. Checkmate at the completion of moves can be represented by the symbol "# " (some use "++" instead, but the USCF recommends "# "). Or the word mate is commonly used. Occasionally the double dagger (‡) is seen. Checkmate is also represented by "≠" by Apple Inc. The notation 1-0 at the completion of moves indicates that White won, 0-1 indicates that Black won, and ½-½ indicates a draw. Often there is no indication regarding how a player won or lost (other than checkmate, see above), so simply 1-0 or 0-1 may be written to show that one player resigned or lost due to time control. Sometimes direct information is given by the words White resigns or Black resigns, but this is not considered part of the notation, rather a return to the surrounding narrative text. Figurine algebraic notation (or FAN) is a widely used variation of algebraic notation which substitutes a piece symbol for the letter representing a piece, for example: ♞c6 in place of Nc6. (Pawns are omitted.) This enables moves to be read independent of language. 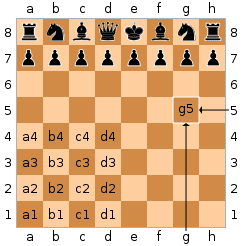 A form of long algebraic notation (without hyphens) is also notably used by the Universal Chess Interface (UCI) standard which is a common way for graphical Chess programs to communicate with Chess Engines (eg: for AI). The symbol chosen is simply appended to the end of the move notation, for example: 1.d4 e5? !